"These burgers are chock full of spicy peppers. When handling the chile peppers be sure to wear gloves, and don't let the pepper oils come in contact with your eyes. Serve on buns with your favorite toppings." Spicy turkey burgers will give traditional beef burgers a run for their money. I didn't have habernero peppers...used japaleno and hot banana peppers. Also added minced onion. We like things spicy and these fit the bill. Will be making these a lot! This burger shrunk alot, and my hubby said it was way too spicy. Husband loved the burger. It had just enough kick. A simple yet delicious way to get some good 'hot' barbeque. My wife and I both love hot foods and this was really simple to prepare and tastes great. If you like it hot this burger is for you. 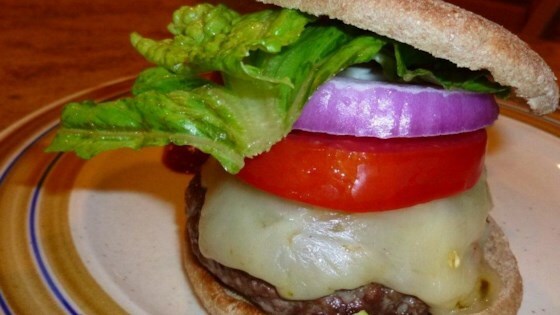 My husband and son went nuts over these spicy burgers! Will a regular at our bbq's. These were delicious. Just the right amount of spice. We added a slice of sharp cheddar. We will defintiely make these again!